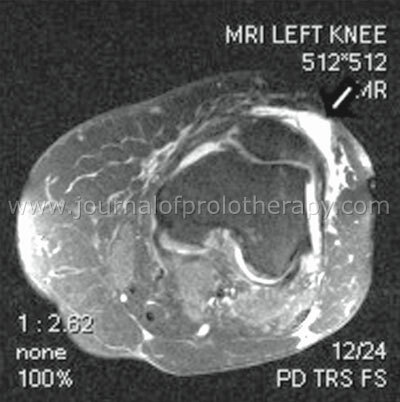 Case study of a 55 year-old female with right medial knee pain. Meniscal injuries are relatively common and may present clinically different due to mechanism of injury, patient’s age, and orientation of tear. The menisci are fibrocartilaginous crescent-shaped structures. The menisci are thickest peripherally and narrow centrally. This shape allows compensation to transmitted forces uniformly throughout the medial and lateral joint compartments, reducing isolated or focal compression to the articular cartilage. The normal medial meniscus is slightly larger than the lateral meniscus. The medial and anterior horns attach at the anterior intercondylar area of the tibia. 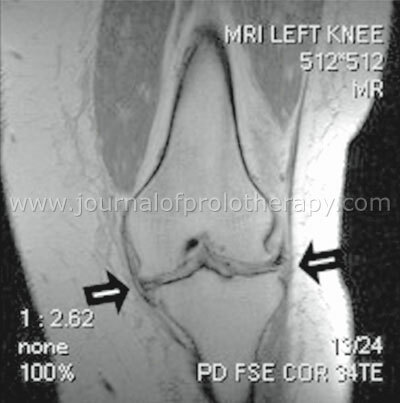 The medial meniscus is intimately attached to the deep layer of the medial collateral ligament. Meniscal tears can be described by signal intensities on MR that can be directly related histologically. Sagittal slices demonstrate the meniscus as elongated signal void rectangles or triangles depending on relationship to the sagittal cut. Normal adult menisci are devoid of signal due to poor vascularization. Children and young adults may demonstrate intermediate to high signal depending on persistent vascularity. This may be confused with meniscus degeneration. Tears are further classified by morphological characteristics generally: vertical, horizontal, and complex tears. Each classification is further subdivided: vertical tears, peripheral tears, capsulomeniscal separation, and bucket handle tears, for vertical type meniscal injuries. Horizontal tears may be termed horizontal clefts, redial tears, oblique and parrot beak tears. Complex tears are a combination of variable tears and fragments. Intrameniscal tears may or may not communicate with the articular surface. Meniscal degeneration results from axial loading with chronic shear stresses. 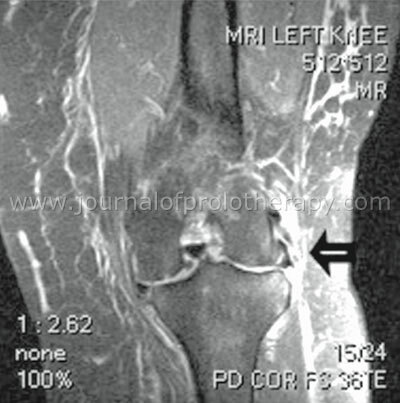 Meniscal cysts may develop secondary to synovial fluid forced through a meniscal tear. What does all this mean to the clinician? The patient’s age, mechanism of injury, type and orientation of tear will drive the treatment protocol. The physician’s experience and training will also be critical to the treatment option. Figure 1. Complex tears of the medial and lateral mensci. Figure 2. Lateral collateral ligament sprain. Figure 3. Moderate suprapatellar effusion. 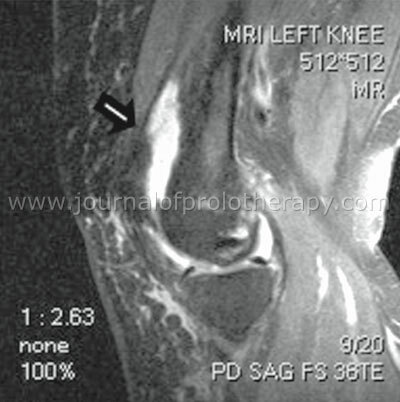 knee pain, normal and abnormal menisci, Jack Henry, DC, DACBR, Volume 2 : Issue 3 : August 2010, Wonder Why?